LUSH started as Constantine & Weir and became a major supplier to The Body Shop (which I love) who then paid £11 million for the rights of Constantine & Weir’s recipes. Eventually, their founders came up with new adventures in the beauty world and ended with the now well-known British brand LUSH! LUSH Cupcake Mask comes in a fresh and funny design. Definitely an unique design. Maybe the coolest we have saw on skincare! Rhassoul Mud is a natural mineral clay that has been used by North African women for centuries to care for their skin, also contains silica, iron, magnesium and potassium. The overall ingredients are OK, but definitely not the best quality. This is noticeable in the results. 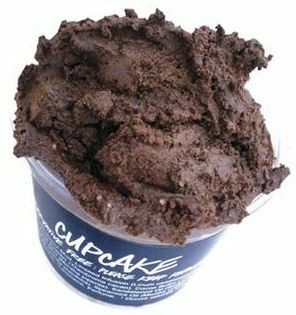 LUSH Cupcake Mask literally feels like you’re wearing chocolate on your face, the scent texture and overall texture of the mask was good enough the truth is that is a little hard to spread on the face because it is a little dry. Another thing is tingly on my skin at first which wasn’t a nice sensation but after all is softening and calms down redness. And by the way, use it only 1-2 times per week. Got really hard, dry and it made it hard to apply after a few times using it. Also is pretty hard to wash off once it’s completely dry. LUSH Cupcake Mask is fully targeted for teenagers, however, is pretty useful if you have oily skin at any age. Ingredients: Rhassoul Mud, Linseed Infusion, Glycerine, Talc, Cocoa Powder, Cocoa Butter, Fresh Mint, Sandalwood Oil, Vanilla Absolute, Spearmint Oil, Peppermint Oil, Perfume. + The packaging is so nice and Unique!